My Top 25 Female Monster Movies! 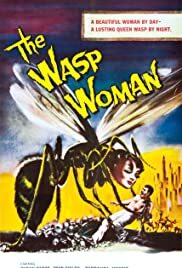 Arthur Cooper: I'd stay away from wasps if i were you, Mrs. Starlin. Socially the queen wasp is on the level with a Black Widow spider. They're both carnivorous, they paralyze their victims and then take their time devouring them alive. And they kill their mates in the same way, too. Strictly a one-sided romance. Classic R. Corman with unique Ms. Cabot! One of Roger Corman's better directorial efforts about reversing the aging process to sell cosmetics in the early 60's! Susan Cabot, the lead, finished her film career with this one before returning to the theatre in New York after many films in the 50's. Unfortunately, she was bludgeoned to death by her dwarf son sometime in the 80's which ended her promising career. She was a serious actress with a terrible final act. A definite 6 out of 10. Best performance = Susan Cabot. Worst performance = Anthony (Fred) Eisley - the "actor" who always managed to reach the pinnacle of Blandness in every film he made in the 60's. Dr. Zin in his spotted pajamas reminds me of someone's Uncle Luigi. An under-rated low budget flick which hits a nerve (cosmetics, pshaw). This is on DVD. Seek it out! 30 of 35 people found this review helpful. Was this review helpful to you?